Yes, I am still decorating my bedroom. Can you tell? LOL! I’m looking for cute end table accessories and this clock is SO ADORABLE OMG I CANNOT STAND IT. The personal problem I am having is that it is GOLD and my bedroom has a more silver vibe to it. I decided not to mix and match those two hues. So, I am going to try to find something VERY similar to this within my color scheme. HOWEVER, if you are in the market for a clock that isn’t digital and has a classic vibe like this one, you are WELCOME. 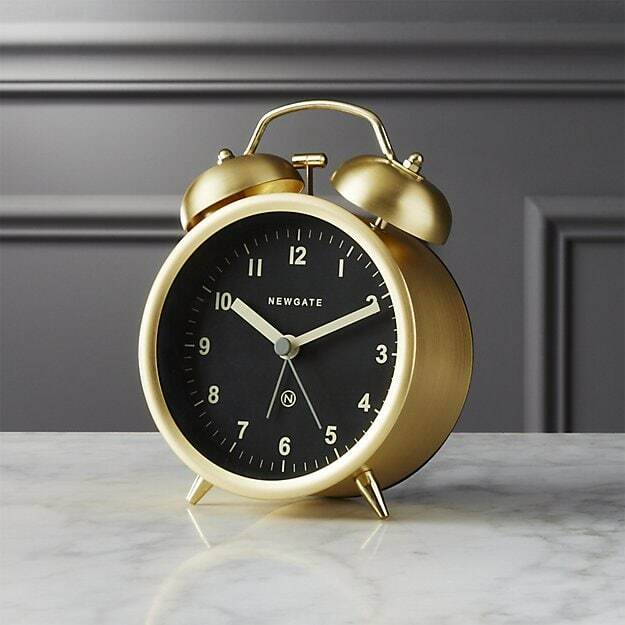 The CB2 Charlie Gold Alarm Clock retails for $29.99. A great price for a piece like this. I cannot confirm whether or not it makes a tick-tock sound, but I can’t imagine it does. I really hate having a digital clock in my bedroom. The light is really distracting. I need total darkness when I sleep and even the cable box can cause me grief. Aw man, I love this so hard! I might get it for my office and call it a day. Previous Post: « The Importance of Migraine Advocacy – Why We Need to Speak Out! It’s nice. Thanks for sharing.